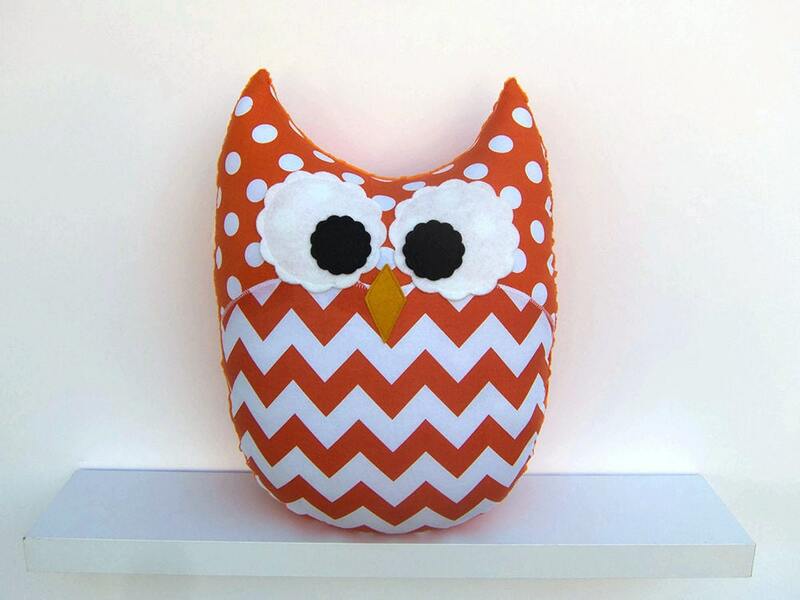 I made this large size, super cuddly owl pillow using quality designer cottons in orange chevron and dots on one side, super soft orange minky (polyester) on the other. Wool blend felts were used for the appliquéd eyes and beak. I'm happy to substitute the minky color on the back; just leave me a note in the space provided at checkout. Measures approximately 15 1/2" tall and 11" wide and filled with a nonallergenic fiber made from recycled plastic bottles. Can be spot cleaned or machine washed with a mild detergent on a gentle cycle. Cute decor for a nursery, dorm room or anywhere you want a touch of color and fun. Shipping is expensive due to the size and weight of this item. Shipping costs in the US may vary by region. I will refund any overpaid shipping charges. Ships by Priority Mail in the US, First Class internationally.